So you just got your guest log drawing in the mail (or it is on its way and your thinking ahead). It is fresh and clean and empty, ready for your loved ones to fill up. The ink we provide for sale through our online shop is acid free and archival. We have found that pigment based inks, though harder to find in the store in nice colors, work better with skin. 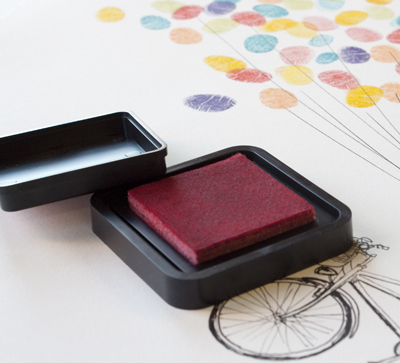 A chalk based ink (which is what you might use a lot if your a scrap-booker) stamps fingerprints all blotchy and dry. No good. If you are going to get your own ink for the fingerprints, please test it out ahead of time to make sure its good. 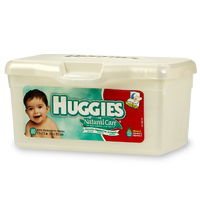 On the big day, I suggest having a white box (or two if you are having a big crowd) of baby wipes on hand at the table with the guest log, so that the guests can wipe the ink off of their fingers before signing their name, and before it dries. It looks nicer if you peel the stickers off and is helpful if you cut the wipes in half ahead of time so they arent huge pieces. Finally, framing before or after the event is up to you. If your ordered a medium drawing or smaller, it might be ok for it to be unframed on a table top. For a larger piece you might want to have it dry-mounted at your local framer or place it in a frame without the glass, so it keeps the edges safe and provides a hard surface beneath it. A piece in a frame is nice to display on a sturdy easel sometimes. My husband and I are both professional artists (of the painting kind), so we wanted to make and do as much of the wedding prep as we could ourselves so that every detail was infused with our style. Ceremony and reception took place on a hot October afternoon at Paramount Ranch (an old movie filming location in the hills with a western town and all). We are both from California but have spent time living in the south so we wanted a country feeling to the event. Each bridesmaids dress was a different shade of warm golden yellows, chosen by each bridesmaid to reflect their individual personalities. Dresses were from J.Crew, Down East Basics, Newport News, Macy’s, and vintage Fred Segel. They wore earrings from Etsy vendor jewelinspired. All of the groomsmen had different grey dress pants and vests with matching teal ties from Kohls and grey vans. 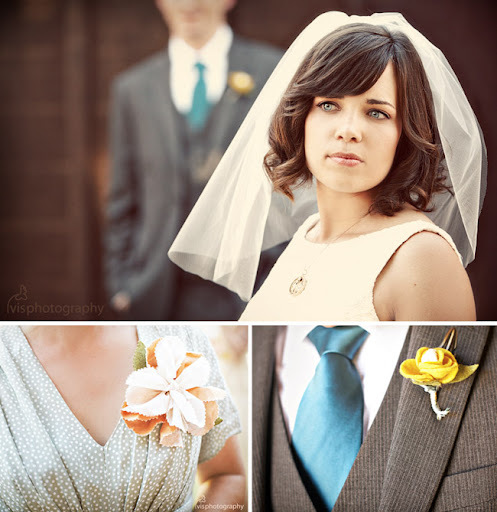 Every boutonniere and corsage was hand made by myself out of felt, vintage fabrics, and feathers. No two were the same. 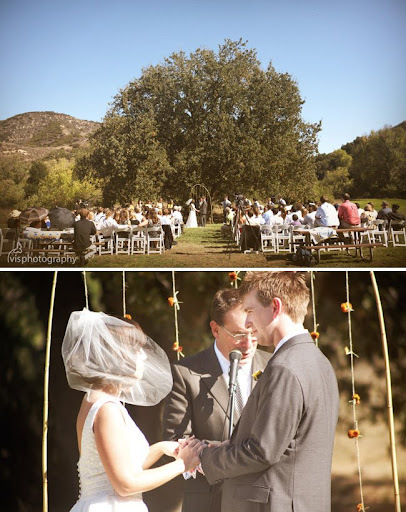 The ceremony was in the middle of a large meadow under a big old oak tree (I grew up in Thousand Oaks, Ca and the invitation suite had an acorn and oak leaf motif). We made the arch that stood behind us together out of bamboo, twine and mums. And the flowers blew in the wind with the breeze. I made our programs and the paper was held together with twigs. The reception was held in the western town with picnic tables and all. 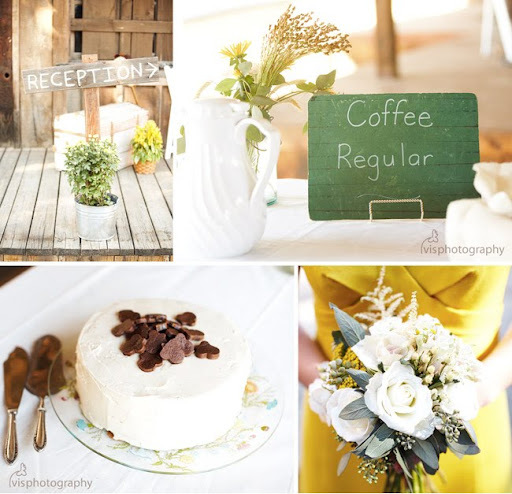 We made all of the unbleached muslin tablecloths for the tables and the floral arrangements were assembled that morning by friends and family – meant to look like fresh picked wild flowers. 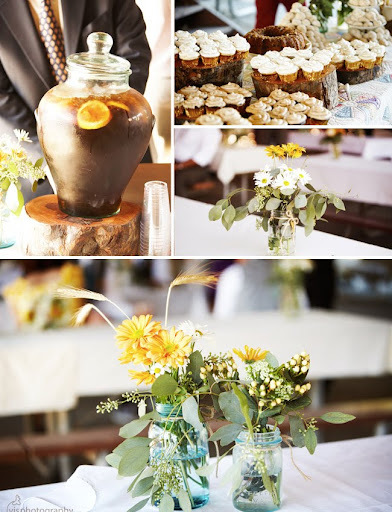 In the year preceding the wedding, my mother collected all of the vintage blue and green mason jars. The guest book was a collaborative creation of my husband and I. 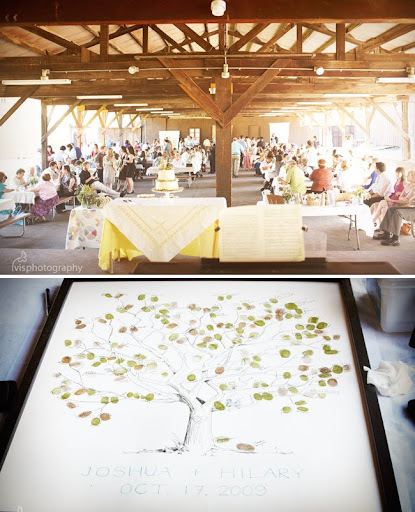 It was a large hand-drawn tree on which guests could leave their finger print and sign as a visual memory of the day. We are now selling these custom made on Etsy. 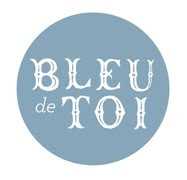 Visit Bleu De Toi to check them out! My groom’s ring was also found on Etsy from a vendor, fabuluster, that makes unique wedding bands with finger impressions on them. His was cast in white gold with an imprint of my finger as a texture on the outside of the ring. It was a surprise and he didn’t see it or know about it until we said our vows and exchanged rings. 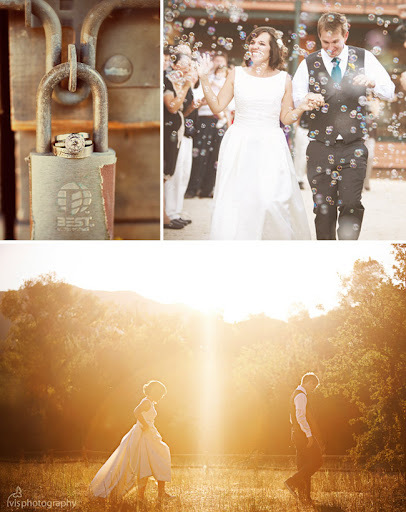 Photographer: Vis Photography, Leah + Rob are a husband + wife team based out of Riverside, CA. Check out their blog to see more of their work. 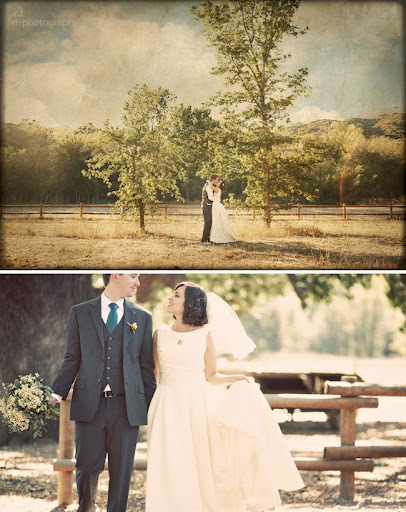 Bride’s Dress: A designer vintage reproduction found on ebay for a steal. It was 3 sizes too big and completely re-sewn by my mother. Accessories: The bride’s veil was made by my mother and I. The necklace and medallion is a family heirloom that all of the women in my family have worn on their wedding day for 3 generations. My great-great grandmother won it in an “expression” competition in high school. The earrings were from Etsy vendor amandamacky. Thanks for checking in on our new blog! Bleu de Toi is excited to offer you more ways to explore our creative hand-crafted products! 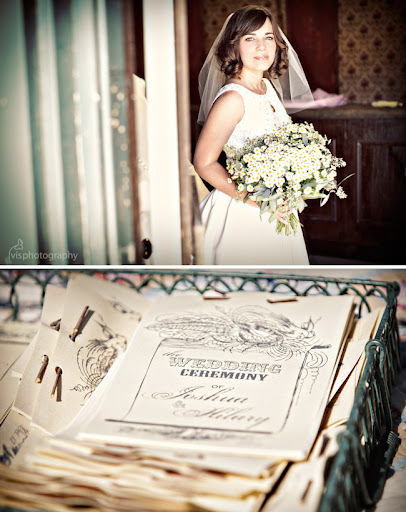 Check back soon for fun features of real weddings, tips for your guestlog art and inspiration!